Discussion in 'Amps and Cabs' started by Denny, Dec 7, 2016. That might help a bit. Not trying to be sarcastic or a jerk. It does have some explanations of the OD trimmer and interactions of the settings and everything else. Yes read the manual. There are actually 4 options accessed by the footswitch. How you get those to function is largely dependent on how you set the controls. And that depends on what you want to accomplish. PurpleJesus and darkbluemurder like this. this is not a 2 channel amp. Green basically lifts the tone stack to give you a volume boost. I set my amp for clean and overdrive. I use the boot mode with my favourite rat type pedal for a whole different tone. Ahhh - I can't get the green light to come on by itself - I have to first press the red button, and then the green will come on. So it sounds like there might be an issue with the switching mechinism? Have you turned up the od trimmer at the back? Red is supposed to give you a fair bit of overdrive. Whether HAD was a genius or not is obviously debatable. But the gain controls he incorporated are pretty smart and make for a lot of adjustment opportunities. And the ratio control is darn near genius. I was a little troubled by the amount of time it took me to find my sweet spots. But after reading further, dialing in this type of amp has thrown folks more than a few times. Once I got in the zone I was seeking, I find my adjustments are small, infrequent and predictable. One thing I should add. 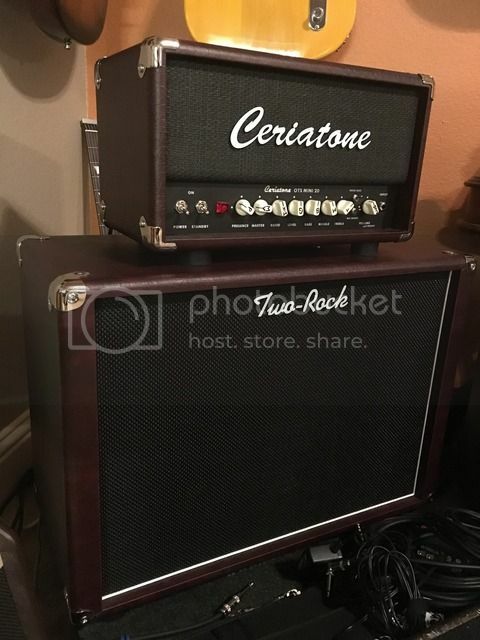 Ceriatone (Nik) is highly accessible via email and he understands dialing in these amps. I would not hesitate to email him for advice. I sent him some sound samples and he helped me get in the ball park more quickly. Phletch, Advisable Owl and Washburnmemphis like this. Phletch and Advisable Owl like this. That is not the way mine operates. I get the 4 options I listed. It does sound like an issue but I can't speculate where. You stated you click the red button and don't get a change. It is control dependent but hard to imagine too many settings where the sound difference between red light off and on is not readily audible. Time to contact Ceriatone I believe. Make sure you have the switches in the back correct. EDIT: Nevermind. The lunchbox doesn't have PAB and OD switches in the back, apparently. Fully agree - that always frustrated me when I built D-style circuits in my amps - same with the old Mark series Boogies. I guess the only D-style amp that would make sense for the way I play is a HRM style (tone controls both before and after OD) with both tone control sets on the front panel, and with the preamp boost simultaneously engaged with the two lead gain stages. Why anyone would want the OD tone controls inside where they cannot be easily accessed is a mystery to me. I guess the only D-style amp that would make sense for the way I play is a HRM style (tone controls both before and after OD) with both tone control sets on the front panel, and with the preamp boost simultaneously engaged with the two lead gain stages. Why anyone would want the OD tone controls inside where they cannot be easily accessed is a mystery to me. Indeed. I used to have a Glasswerks SodII, and he was smart enough to put the controls for that channel on the outside (it had both HRM and non- HRM Channels). The thing about the HRM as done by HAD is that the mid pot is 25k.....useless even when all the way up in that type circuit IMO, unless you like things pretty scooped (I do not). I replaced the mid pot with 100k, put a .0022uf plate bypass cap across the last stage. That enabled me to dial in the fat middy non-HRM tone on the HRM channel if desired, albeit with tighter and more controllable bass, and quite a few other tones it wasn't otherwise capable of as well. As D style amps go, with that mod it was pretty damn versatile. Ended up selling it because the Koch TT2 I modded did pretty much all the sounds the SOD did plus a whole lot the SoD couldn't touch. I've discovered that "D sound", as far as gain channels, is really about a certain EQ curve, not about circuit topology. His clean channel does have a unique compression type effect though with the local NFB, but I'm ambivalent about compression on my cleans all the time. OK problem - EI found out the problem - actually Nik saw the - the builder installed ONE Diode backwards, which cut out whatever - NOW - the amp sounds like it should - great cleans, overdrive and boost!!!! Thanks Nik and crew!!!! What an awesome sounding amp!!! (BE READY TO HEAR YOUR MISTAKES lol). Phletch, gigs, Wirezz and 1 other person like this. You started this thread today at 9:31 with a broken amp by 3:00 the amp is fixed. That's great customer service. NicDo, Phletch and AustinIsPresent like this. I actually labeled my knobs to be more intuitive when I glance at them. Also made me a little cheat sheet card that I had sitting on top of the amp for a while until I could get it dialed in form low volume use. Nik asked for some pictures of the build (not mine), and he found one diode was in backwards - which is why I couldn't grasp the operation of the amp. Flipping the diode took care of any issues related to switching. So now the amp functions as it should. To help those who are experiencing issues as HOW to set the amp up - it's not that difficult. THE GREEN LIGHT IS A BOOST SWITCH - PERIOD - IT REMOVES THE TONE STACK AND GIVES A "BOOST" TO EITHER CHANNEL.